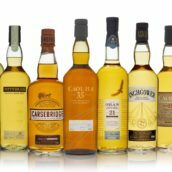 The folks at Diageo have been paying a bit of attention to Talisker recently. With the 35 year old Special Release at the end of last year, a packaging update for the 10 year old, the recent release of Storm and a revamp of their visitors centre, the distillery is getting a bit of love. However, it hasn’t ended with the Storm and their latest release is something a bit different: the Port-finished Talisker Port Ruighe. Nose: Chocolate, turf, raisins. All quite rich and upfront, with red wine plumminess coming through strongly. Some putty and dusty notes. Reveals bandagey, Jaffa cake and bramble aromas with time in the glass. Palate: Wine-like berry fruit, much more fruity than expected from the nose. Also wet peat, spongecake with damson jam, chocolate raisins, earth, burnt gingerbread. 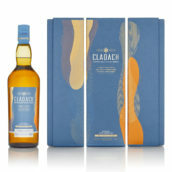 The peat smoke is much more evident on the palate than the nose. Finish: Drying and gets a bit dusty with wet oak, but some cocoa notes save it. Marinated raisins, prunes, dried mud and chocolate shavings. Comment: A departure for Talisker and as someone who generally dislikes red wine finishes this was much more drinkable than I expected. Nose: Crunchie bars, Turkish Delight rosiness, rich salty caramel, touches of dried fruit. Quite light and fresh for a Port finished whisky. Palate: More Turkish Delight bars, heavy on the rosewater, stewed raisins, lots of caramel sweetness and a smoky burnt toffee/treacle note. Finish: Smoke pops up more on the finish, with sweetness slowly fading to biscuity wood (chocolate digestives). Comment: This is definitely not your regular Talisker – loads of oily sweetness as well as floral note that came through as Turkish Delight for me (specifically Fry’s). Interesting and different but not really my cup of tea. 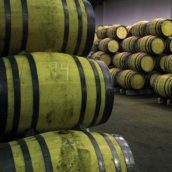 If you like wine finished whisky, then this will be right up your street. On a related note – pronunciation. 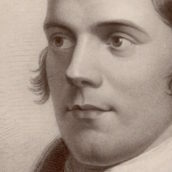 According to the Genuine Scotsman(tm) I cornered when recently north of the border, Port Ruighe is pronounced ‘Port Ree’. Which fits in, as Port Ruighe is the old Scots name for Portree, the largest town on the Isle of Skye, home of Talisker. Consider yourself educated. 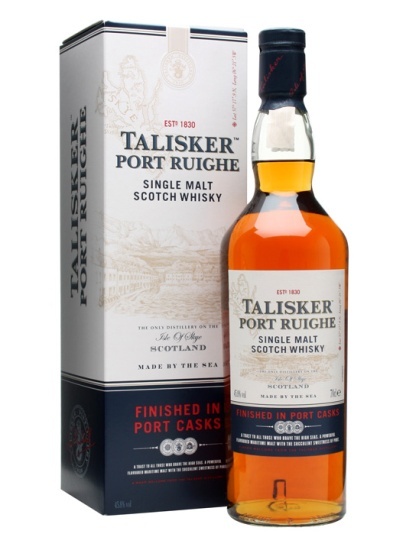 The Talisker Port Ruighe is now available at The Whisky Exchange priced at £45.25.